Boat Monitoring Solutions | ARMIT Marine | IoT Marine – The Smart Way To Monitor What Matters On Your Boat. DID YOU KNOW THAT 80% OF BOATS THAT SINK GO UNDER WHILE DOCKED? Whether you have a 21-foot outboard, a 35-foot cruiser or 42-foot catamaran, industry data* shows that the majority of sinking/water incidents take place while you’re away, and your boat’s docked. 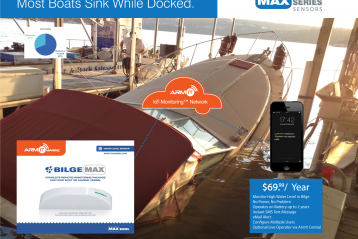 NOW THERE’S A SMART WIRELESS WAY TO KEEP YOUR BOAT AFLOAT.  ARM IT MARINE provides a suite of wireless smart sensors that keep you informed and alert 24/7. With ARM IT wireless and sensor technology, you’ll be able to monitor high water levels remotely without draining your battery or relying on an electrical outlet. It’s totally self-sufficient. 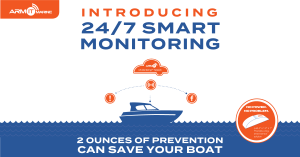 ArmIt Marine provides the simplest, most affordable boat monitoring system on the market today, offering boaters an instant solution to Protect What Matters Most. Getting your Boat Connected has never been easier. Monitor bilge water levels, open or closes on hatches, doors or cabins, temperature or water leaks. 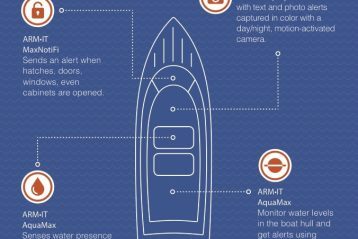 Worried about unauthorized persons on your boat? No problem, get instant Photo-Alerts to your smart-phone with MotionCam Pro™. Did we mention simple? ARMIT MAX Series™, IoT-Monitoring™ sensors are battery powered and have the network built-in. Our sensors are completely autonomous, self-sufficient and require no additional equipment to operate. No Hubs, No Gateways, No Routers, No Power, No Unreliable WiFi at your dock, marina, or mooring. Best of all, no complex programming or wiring diagrams. 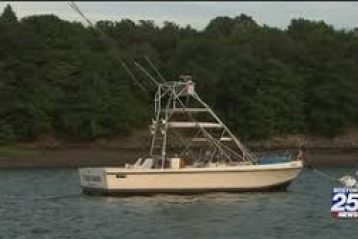 It’s that easy, simply create your account, select your connection plan and in a few minutes power on your device and your boat is instantly connected and monitored. Starting at $69.99 per year, ArmIt Network provides IoT-Monitoring and Alerts for your device. Knowledge is power. Most disasters can be averted with just a few minutes of notice. Get instant, real-time ARMIT-Alerts™. With the cellular connection built right in, you don't need to rely on faulty weak WiFi at your dock, mooring or marina. Use ArmIt monitoring solutions 'anywhere' in the world. No wiring to boat your power systems required. Simple DIY! Battery should last 3 years in normal operation. Each ArmIt sensor has an easily replaceable AA or CR-123A battery. Activate ArmIt sensors in minutes. Create your account, select your plan, wait a few minutes and power it up. It's that easy. Most trusted online payment system with encrypted tranactions. How much is cellular connectivity and monitoring for ARMIT MAX Sensors? Our IoT-Monitoring service for ARMIT MAX Sensors, which includes annual cellular connectivity and unlimited ARMIT Alerts: text and email is $69.99 per year. Monitoring service for ARMIT MotionCAM Pro, which includes annual cellular connectivity and unlimited ARMIT Photo Alerts: text and email is $99.99 per year. Using a high-quality CR123A Lithium battery, users can expect to get 400 cycles of use over an extended period. In normal operation that's 3 to 5 years. ARMIT recommends for best practice, changing the battery each season. The MotionCam PRO operates on 2AA Lithium batteries and should last 200 cycles. Your ArmIt device is configured to check-in to the network every 15 days and all device activity and operation parameters are available in your account dashboard at myARMIT.com. How do I test BILGEMAX after it is installed in my boat? How quickly will I be notified if water level, motion or water leaks are detected? It takes about one minute for the notification sensor to process and sends its status change to the ArmIt network. Once the sensor reports its status change, in milliseconds ARMIT Alerts are sent via SMS text message, email and Photo-Alert to customer. 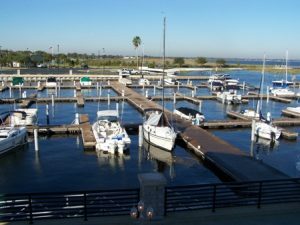 I own a marina or I am a marine service professional, can I manage multiple devices easily? Yes, you can. Yes. the myARMIT.com IoT-Monitoring platform was designed with you in mind. Contact ARMIT or your sales representative or authorized ARMIT dealer for details. Send an email to info@armit.co and we will be happy to get you contact info a dealer/installer in your area. Where should I install the BilgeMAX NOTIFI and BILGEMAX Float sensos? ARMIT recommends placing the BILGEMAX Float in the bilge just below the water line. There is 3/8" from the bottom of the blue-float housing to the bottom of the float sensor. ROute the attached 15' feet of cable to the highest-dryest part of your boat to connect to the BILGEMAX NOTIFI sensor. My boat hat more than 1 Bilge, do I need a separate BILGEMAX kit to monitor each bilge? From your myARMIT.com dashboard, you can change device settings and customize alerts, notifications, multi-sites and unlimited devices. The ArmIt Network provides complete device management and history, you can view everything on a powerful, customizable dashboard. ArmIt cellular monitoring sensors have full two-way authentication and over-the-air provisioning. When a configuration change is made to your ArmIt MAX Series sensor, the next time it contacts the network, it self-updates. Basic service includes ArmIt Alerts with unlimited text messages, eMail alerts, and fully customizable device management from your dashboard. Boat Bilge Pump Monitoring, bilge water level Monitor or monitor you're for boat water leaks. Receive instant alerts to your smartphone and eMail. With MotionCam Pro - Receive instant photos when someone enters your boat or protected area. Monitor temperature range for freezing or excessive heat and get instant alerts when out of range. I can't believe how simple the install process was and I'm amazed at how much technology is in this little sensor. We're ready to answer any questions you might have about our products, a new service, or any other help you need. You can call us at the numbers above. Or, fill out our information form below and one of our team members will be in touch as soon as possible.